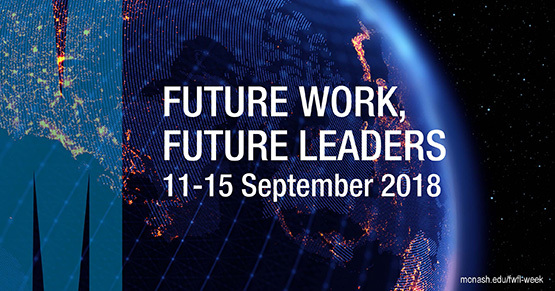 Embrace the challenges ahead and prepare yourself for the future of work during Future Work Future Leaders Week 11-15 September. Robotics, artificial intelligence, globalisation, and other disruptive trends are reshaping every aspect of our lives. Explore the future and what it means for your career across a series of informative and innovative events in Future Work Future Leaders Week. Explore some of the megatrends disrupting the economy at the Future Work Future Leaders conference. Follow up with interactive sessions, where you can try your hand at robotics, test employability skills and ask questions about working in industry after PhD. Book your place in a public lecture at Federation Square to hear world expert Dr Catherine Ball discuss drone technology; and pick a side in the debate Is automation good for humanity? Places are limited for each event and activity, so register now at the Future Work Future Leaders website.